Acclaimed bestselling novelist Kunihiko Hidaka is found brutally murdered in his home on the night before he’s planning to leave Japan and relocate to Vancouver. His body is found in his office, a locked room, within his locked house, by his wife and his best friend, both of whom have rock solid alibis. Or so it seems. At the crime scene, Police Detective Kyochiro Kaga recognizes Hidaka’s best friend, Osamu Nonoguchi. Years ago when they were both teachers, they were colleagues at the same public school. Kaga went on to join the police force while Nonoguchi eventually left to become a full-time writer, though with not nearly the success of his friend Hidaka. As Kaga investigates, he eventually uncovers evidence that indicates that the two writers’ relationship was very different that they claimed, that they were anything but best friends. Still was it enough for a crime? The beginning was really slow but, being told over and over again that the book is good, I didn’t give up. I became definitely more interested in the plot when Osamu was accused of murder and owned up to the crime. My interest even grew further when Kaga kept digging anyway because in his humble opinion something was off. Kaga’s diligence was a bit strange, almost bordering obsession, but that’s how a good investigator is supposed to act, right? Overall all the characters seemed to me a tad too schematic, almost like origami figurines, but maybe that’s a cultural thing; after all the Japanese society has never been known to encourage colourful personalities and bursts of feelings. I also wanted to read more about the females which were left out like props after a while – another move reflecting, I suppose, the position of a woman in an Asiatic country. Then came a part with interviews, conducted by Kaga, and it almost lulled me into boredom. The final bit made it up to me a bit although I still wish it was done differently, not as a kind of monologue of Kaga facing mute Nonoguchi which once again was a pain to read. Oh well. The cover art is gorgeous, though, and cleverly done. An interesting whodunit which will surprise you more than one time – if only you manage to wade through the first 50 pages or so. 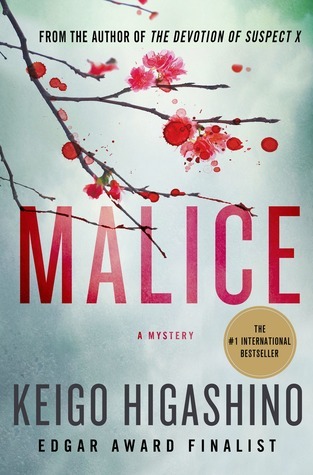 This entry was posted in book review, contemporary, crime, mystery and tagged japanese whodunnit, keigo higashino, male main lead, malice, modern japan, series alert. Bookmark the permalink. But I dnf so quickly! I DNF but only with difficulties. Sometimes it is an asset. Btw congratulation, young mama! Yeah, I’ve heard plenty of good things about the Devotion of Suspect X so definitely I am going to read it. The beginning of Malice was difficult for me because I am so impatient sometimes. Yes this is completely accurate and I have read many books set in and about Japan, but there is a way to still present this, but still give the characters character. It is rough. BUT overall, it does sound interesting even with all the bad things. Let me just add, Carole, that I don’t regret reading this one.